This week I am noticing a lot of yellow and orange flowers in bloom. They are very beautiful, and remind me of the sunshine that has finally decided to stick around for awhile. Here are some pictures of the Stella D'Oro Day Lily- I have a few of these in my garden, and they always do really well. This is one of those plants that some say you can't beat dead with a stick- to prove that my lab puppy, Zoey, at the beginning of the season when they first came up, took it upon herself to dig at them until they were mostly to ground level- after putting up yet another fence- they grew back, and are flowering nicely. So if you don't have a green thumb, this is the plant to choose. Stella D'Oro means Star of Gold, and they do indeed look like a bright happy star. Peeking out from various garden foliage (a.k.a. weeds that grew from bird seed that I still need to pull) are some beautiful orange violas. I love this peachy orange color. Some of the Sedum has started to blossom pretty yellow flowers. The marigolds are starting to do nicely- I love how this classic garden staple stays colorful for so long- this is the first year I grew some from seed and they are doing well- next year I plan to try a few more varieties. I love tucking these in throughout the veggie garden. I finally planted some Nasturtium, I have wanted to for years, it is so beautiful, some of them are this dark electric orange, and some are yellow with orange markings, they are doing really well. Here is an update on the now ginormous weed that we have left in the garden to watch and blog it's progress over the summer. I will have to bring out a measuring tape this week to be sure, but it must be more than four feet tall, and is now covered with flower buds, we are all getting very excited to watch this one bloom. It is really something to see, very huge, and very prickly, I imagine the birds will love the seeds. Today we decided to eat lunch at a beautiful little park we have right in our neighborhood. 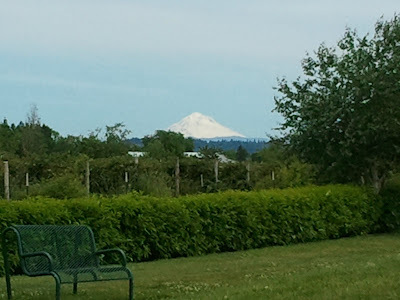 This little park sits right next to a large field of berries, and has a lovely view of Mt. Hood off in the distance. It is also surrounded by wet land so there are plenty of birds fling around. Perfect Sunday lunch spot. While we were there walking around the little trail, I spotted yet another blooming yellow flower. I am not sure what this one is called, if any one knows what this flower is, I would love to learn. Very pretty delicate petals with a wonderful center that just dances in the wind. It is on a low little green bush, very pretty flower. All of these sunny colored flowers reminds me of this happy bible verse. What a beautiful series of lovely yellow blooms in your yard, April. We have some Stella D'oro and they are doing very well in the cool weather we've been having. Love the photo of the mountain as well. What a scenic place to have lunch. Awesome! I'm so glad you updated us on the giant weed. I was just thinking about it this morning actually. Since I have a black thumb, I'll be keeping Stella D'oro in mind for the future. Could that yellow flower be St. John's Wort? We had some in our yard when I was little and I think that's what my mom told me they were. Thanks Nancy, I am really enjoying your blog and YSB, such wonderful pictures!! Jackie- glad to hear you are following the progress of our giant weed, can't wait to see how big it gets. 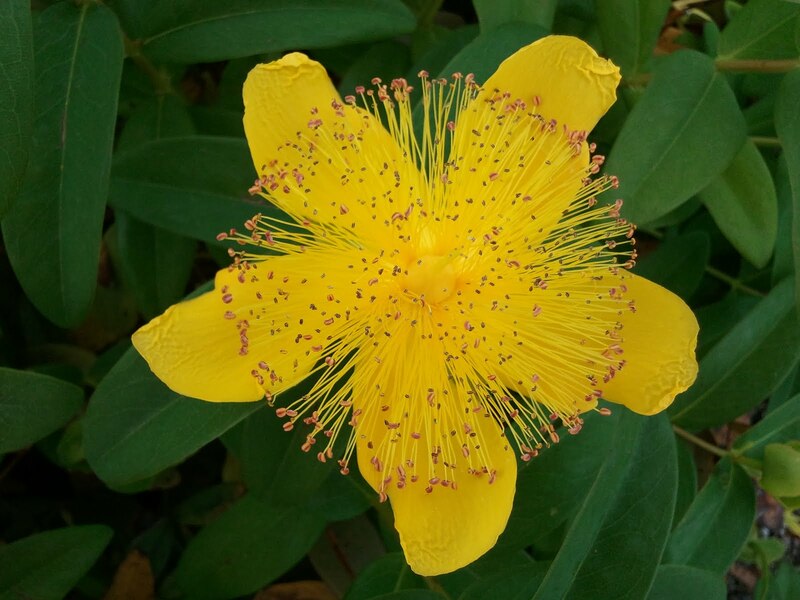 Also, Thank You, I think you are right about the yellow flower being St. John's Wort, I just googeled it, and the pictures look right on- I love putting a flower with a name- I had no idea something like St. John's Wort just grew like that, it is very pretty! Thanks for solving my mystery!! How relaxing to look at your photos! 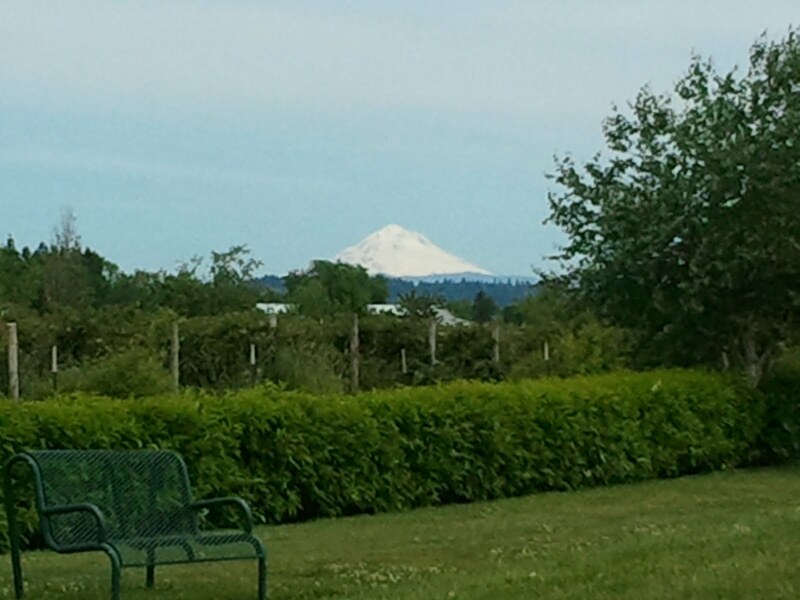 I especially enjoyed the picture of Mt. Hood! Neat! Isn't it funny how flower colors seem to bloom in waves? Right now a lot of pink flowers are in bloom in our garden. Thanks for all of the nice comments!! It is interesting how the flowers bloom in different waves of color- early June I had lots of purple, now the yellows, and I am also starting to see a lot of the pinks my dianthus are a beutiful pink, this year I didn't get in any petunias- I love their pinks. Soaftearthart~ Your house sounds beautiful- yellow is such a happy color.